Burning car, Watts rebellion, 1965. From KIT 345, United Presbyterian Church in the U.S.A. Board of National Missions urban ministries presentation, 1967. 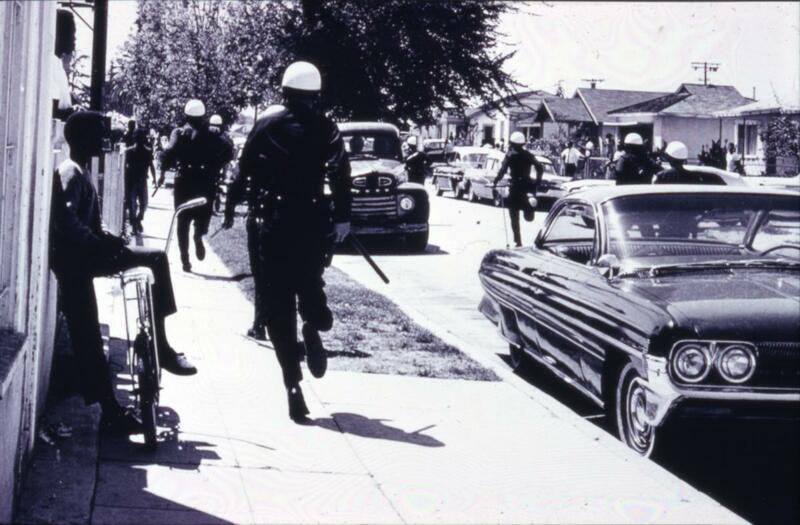 Police chasing men, Watts rebellion, 1965. From KIT 345. In 1959, the presbytery funded and organized the Westminster Neighborhood Association, offering, like New York's Labor Temple a half-century earlier, a space for residents of all faiths to converge and organize. Using a two-story storefront donated by a local businessman, Westminster hosted youth clubs and civic organizations, collaborating with non-church groups to address the neighborhood’s impoverishment. When riots swept through Watts in August 1965 after the arrest and beating of a black youth, the Westminster building was the only one on its block unclaimed by fire. Gayraud S. Wilmore of the United Presbyterian Church in the U.S.A. Commission on Religion and Race visited Watts after the riots. By his account, it was no accident that the Westminster building was spared. Casper Glenn of nearby Bel-Vue Presbyterian Church and Westminster’s Archie Hardwick were “constantly in the streets,” attempting to reason with rioters. The Presbytery released Glenn from his pulpit for two months solely to work on the street. 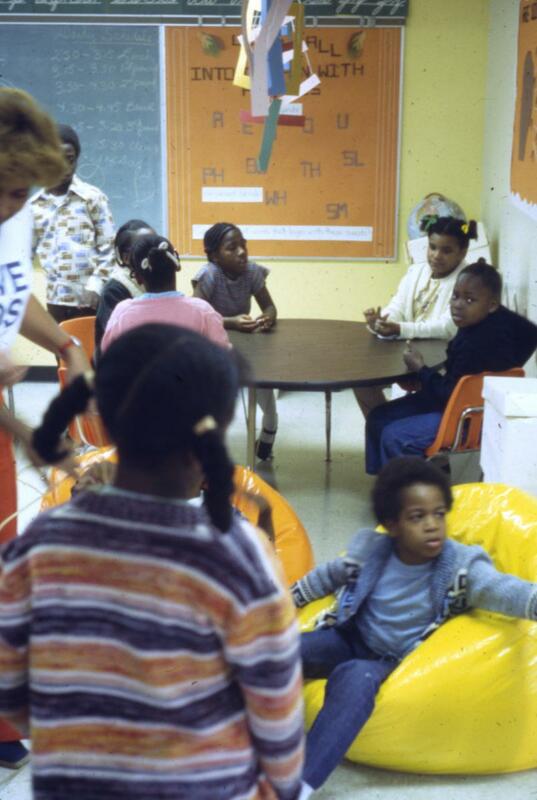 Westminster Neighborhood Association classroom with phonics lesson, 1977. From Acc. no. 14-0424. Following the rebellion, the Commission on Religion and Race pledged new funds to Westminster, and its mission expanded. Budd Schulberg, writer of On the Waterfront, organized the Watts Writers’ Workshop there; the noted black nationalist Maulana Karenga taught Swahili and African history. Westminster sponsored community trips to the beach, organized a football team, and operated a day care center. E. Grace Payne took over as executive director in 1972, and barnstormed Presbyterian congregations across the country soliciting donations, ultimately bringing in $500,000 for a new headquarters building. New construction began in the 1970s. From 1988 to 1990 the Association spearheaded development of affordable housing in Watts, establishing the 130-unit Westminster Park Plaza, which remains the organization's legacy to the community it served.